This is what we could see on our IWB while we waited for them to join us. 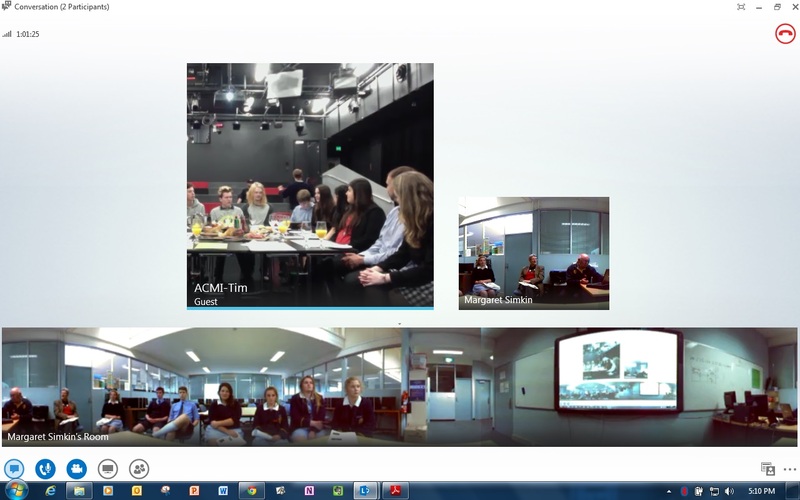 On Wednesday this week we hosted an ACMI Intermix student conference through our Microsoft Lync platform, using our Polycom round table system. The live event ran at Federation Square from 5 till 6pm, which meant we would not be able to participate in person. Contacting the host Tim Bright (see: http://timothybright.com/ ) to suggest a webinar felt pretty cheeky, but it really paid off. 7 excited students from years 9 – 11 sat in IT1 with their own (less extravagant) afternoon tea, Mr Cook and myself, and were able to suggest ideas, ask questions and hear about many interesting things. This event did not take place without some time consuming hard work by Mr Ian Cook (our IT technician) and Simon Dargaville (IT at ACMI), for which we are very grateful. The top left hand image in this photograph shows the people in Melbourne. The smaller image to the right shows part of IT1. The panorama at the bottom shows the students attending our part of the conference. 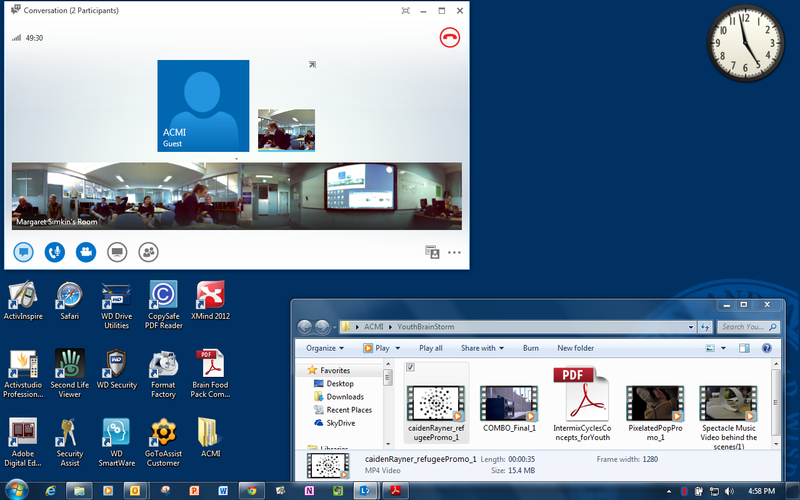 With the Polycom unit the camera angle moves to focus on the person speaking. I was delighted that all our students spoke and offered suggestions, as attending this type of webinar can be quite confronting. Once again, I was proud to be part of such an active learning community. This event will lead onto some further interaction with Intermix programs: http://www.acmi.net.au/intermix.aspx and some local film making based activities run in conjunction with our library. Watch this space and SIMON for further details! By Margaret Simkin in Uncategorized on November 22, 2013 .